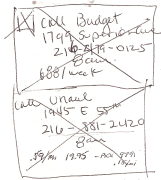 The busier I get the more I worry about forgetting details or things I said I’d do. Sometimes tasks get shoved down in the list for good reasons. But then they can be lost for ages. And I hate that! I’m thinking Bullet Journals, but I’ll get to that in a minute. Put them all in a box or basket. Enjoy the cleaned up space. Nice. And pretty quick… for cleaning. But not keeping track. For years I used paper notebooks. I saw a man on a plane copying stuff from one spiral notebook to another. He told me everything he’d noted in the month was in one notebook (the “write stuff in one and only one place that you trust” method). He’d refer to the notes. Cross out what’s done. Keep track of phone numbers, etc,. everything he’d collected that month. At the end of the month he copied what he still might need to do into a clean notebook. Then he filed the old one. Generally different colors each month helped remind him where he might have jotted stuff. I used that system for a long time. It has worked. I can generally flip thru the pages quickly and find what I need. 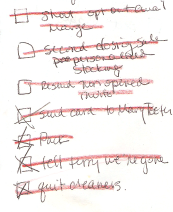 I cross out the stuff that’s done. Or draw a big box around a group of things and put a big X across the middle. But sometimes stuff just gets lost in the book. Or I spend too much time paging thru to find what I’m looking for. And then… Oh, look, a chicken! I use my computer’s calendar to keep track of events and contact info, so I don’t need to write that in a book. But the “To-Dos” are harder. If I keep the list in my computer, I’ll probably never see it. So I need to write it down on paper (that I can find again!) I’ve tried ToDoist (you have to sign up) and Google Task list, to name a few. None have really helped me see what I need to do next. Bullet Journals: Is this the one true way? I’ve been playing with the idea of using a bullet journal after Joe Casabona, at WordCamp Scranton, suggested it as a great way to use the (beautiful!!) speaker gift notebooks. The instructions seem a little overwhelming (Like David Allen’s rules). However, today I stumbled on a revised notion of tabs and dots. Everybody gets the notion of tabs. 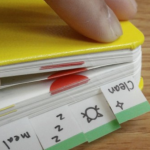 Post–its are great for tabs because you can easily move them around. These heavy duty ones are great, but the regular small size post-its, stuck on upside down so the non-sticky part sticks out, work pretty darn well also. But the dots are brilliant! Fold over colored stickers on the edges of pages to signify pages that go together. Red for food journal pages, green for things you just want, blue for gift ideas. You get it, right? Marking a collection of pages on the edge and there’s a much greater chance that I’ll be able to find those pages when I’m looking for that content. Have you used Bullet Journals? Have you found a way to make the process simple? What’s been working for you?